You probably all know the old saying 'fool me once shame on you, fool me twice shame on me' or perhaps just the infamous George Bush mangled attempt at using it at a press conference. Well after lunch we wandered around the old town district of Phuket Town as we had some time left until we met our driver. 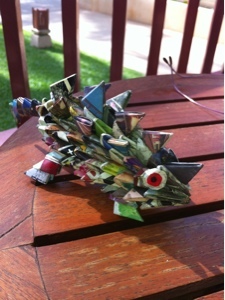 I bought Charlie a cool lizard made from folded cardboard. 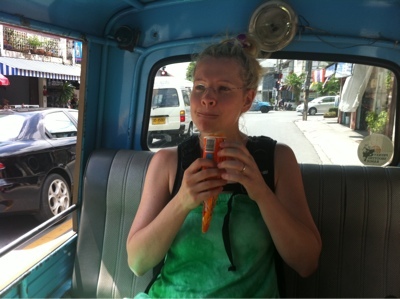 We then were accosted by tuk tuk drivers as seems to be the norm. He offered to take us to a nearby market for 10 Baht each. Maybe because it was very hot or maybe we were just excited about some cheap transport for a change but we foolishly agreed. Of course he didn't take us to a local market but to another tourist centre where he would no doubt receive a fuel voucher or some other kickback. At least this time we were wise to the scam and didn't get out of the tuk tuk. We asked to be returned to where he picked us up and he was happy to do that for us so all in all it wasn't too bad. We paid him 20 Baht and were happy to have had a short rest from walking. We made our way back to the meeting point and purchased a hat for Charlie which we had been annoyed at ourselves for not doing much earlier. 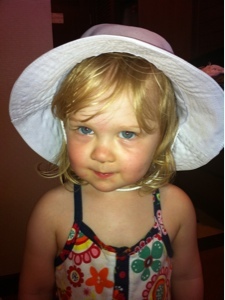 She is heavily lathered in sunscreen each day though. 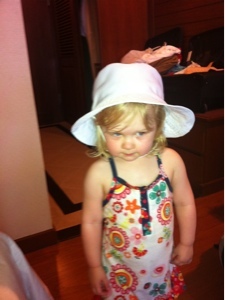 It's a Thai girls school hat and she loves it. On the way back to the hotel we quizzed our driver for local dinner options that don't cater specially for tourists. Once he realised we weren't going to pay him for a trip to Patong or Phuket Town he showed us a restaurant nearby where the locals eat and agreed to come and get us for dinner and take us home for 300 Baht. We are pleased to have dinner sorted and also very happy not to have to eat at the Kata tourist restaurants again.